A beautiful garden or a perfect green lawn can make your home look attractive but also increase the value of your property. Hiring a professional to maintain your yard is often too expensive for an average person to afford, but finding free time in between your work, family, and household responsibilities can be even harder. Several tasks need to be taken care of in order for a garden or a lawn to grow healthy and beautiful, and all of them have to be done in a particular time frame or would otherwise be ineffective - watering is one such task. Owning a high-quality hose is, therefore, a must, but often not enough due to the lack of free time to actually use it. Therefore we have set out on a mission to find the best hose timer that will allow you to water your garden without having actually to do anything. Once you install the hose timer and set it properly, it will take care of this tiresome chore for you, and your garden and lawn will thrive. Read our reviews of the five best hose timers we have found and tested for you and choose the one that answers your needs the best and enjoy an attractive and healthy vegetation around your home. Why Buy a Hose Timer? If you have a large part of your property taken up by a garden or lawn, or even both, you surely know by now how much effort and time it takes to tend to it properly. Numerous tasks need to be performed on a daily basis, no matter the season. Knowing this you are probably constantly in search for easier and quicker solutions - a hose timer is one of them as it saves both your energy and your precious free time allowing you to concentrate on more important things in life. Water is precious, not only for those ecologically-conscious, or those on a tight budget but rather to the entire humanity. People take it for granted believing that having water is a permanent state. However, there are parts of the planet which have no running water; in fact, there are more people who have cell phones than those who have access to clean drinking water. Our society is also struggling to preserve it and avoid water shortages or bigger issues that might arise from unnecessary overuse of this valuable resource. For this reason, each of us should at least try to conserve water, not waste it; in the end, both the Earth and your wallet will be grateful. As it saves water and your money, hose timer allows you to grow your garden or lawn in the best possible way - more successfully than it could ever be probable with hand watering. Namely, using a high-quality hose in combination with a reliable hose timer guarantees even distribution of water; this means there will be no waterlogging which can cause root decay. Watering will also be always right on time - it will not be influenced by you other obligations or postponed due to emergencies or unexpected situations. Mechanical or analog hose timers are typically controlled by a clockwork mechanism and are easier to use and less likely to break down. Moreover, they are usually highly affordable. We recommend this type for less demanding users who intend to water their property once to twice a day. Digital hose timers but normally offer more in terms of additional features and available irrigation programs. They usually have LCD displays, digital control and allow you to set up the exact time and the desired watering routine. They are typically more expensive, more complicated to use and more prone to malfunctioning due to sensitive parts; but, with clear instructions and a bit of extra care, they will provide more possibilities than analog timers. What Features to Consider When Buying a Hose Timer? The number of valves you will need depends mostly on how large your property is. 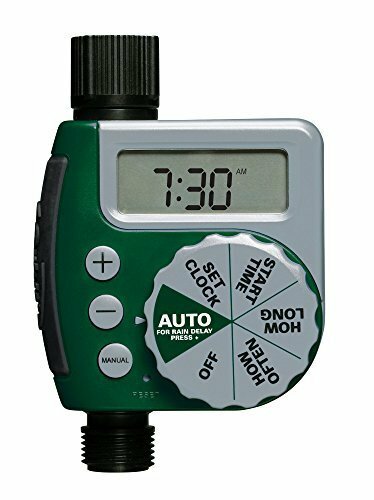 Most timers feature either one or two hose timers, but there are certain models which allow you to control more than three valves and thus numerous different areas at once. Multiple hose timers allow for better control and flexibility but also come at a higher price. Most people water their lawns and gardens once per day, and for them having a possibility to set more than one watering session a day may seem redundant. However, some plants require to be watered several times in a single day, and therefore most hose timers allow you to set between two and six watering sessions per day. The most expensive models, usually intended for commercial use, may permit for as much as eight sessions. Moreover, besides allowing you to schedule watering sessions and their number, you can typically also set watering time for the optimum amount of water. •The intensity of the water flow - some timers can be programmed for different levels of water flow intensity, usually from one to eight gallons per minute (GPM). •The rain delay feature - this feature enables the timer to “sense” the rain and thus skip a watering sessions scheduled during, or immediately after the rain. The delay time can be set to one, or up to three days. Most outdoor hose timers use batteries which usually don’t have to be replaced for four to six months. Typically there is a flash or a light that warns you when batteries are almost empty. It is best to choose timers which can retain the program while changing the batteries. Indoor timers usually use electric power to function, but more advanced models also have a built-in battery in case of power outages and do not need to be reprogrammed afterward. You should choose hose timers which are easy to install, set up and program. If you are an average home user, you might want to consider avoiding too many additional features and sticking to basics - you will save money and be able to use the timer with no confusion. Modern LCD displays might seem overwhelming at first, but a little effort to carefully study the instructions, and a little bit of trial and error, and you will certainly overcome any difficulties. It is usually fairly easy to install a garden hose (you can use a soaker hose to save more water) as most of the models require only attaching the timer nozzle to an outdoor hose faucet and connecting the end of a hose to the valves at the bottom of your hose timer. 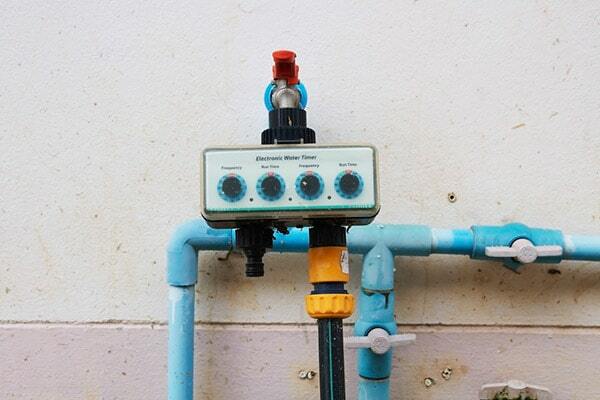 The spigot has the male end, and the timer features two female ends - one needs to be screwed to the water source and the other to the receiving hose or drip lines. Make sure that everything fits tightly; you can use plumber`s tape to secure the seal if necessary. Programming the timer, especially the ones with a great number of functions, can prove challenging. All the systems are different, but good instructions and manuals, or YouTube videos can help you familiarize yourself with the interface and setup all the needed parameters for the optimum watering results. You might also want to check the batteries and make sure they are fresh as you do not want for your new hose timer to unexpectedly stop and leave your lawn or plants without precious water for days. Orbit 62061Z is a single outlet digital hose timer powered by two standard 9V AA batteries and designed for outdoor use. It is built out of durable and waterproof materials, but since it is mostly plastic, we recommend positioning the timer in the shade to avoid any sun damage. This timer is exceptionally easy to install and use. We have not even read the manual and were still able to program it as controls are quite self-explanatory. Once we have set the program, our job was done as the timer has proven to be very reliable and punctual. It also includes a pass through feature which allows you to turn it off for a set period of time without it discarding your set schedule. Orbit 62061Z features a rain delay option to avoid sogginess in your garden or lawn, but the delay time is fixed to 24 hours and cannot be altered. This timer also allows for setting the length of watering time (1-240 minutes) and choosing the number of watering sessions ( 4, 2 and one time per day, or once every other day); it would be worthy to have a few more details about watering options though. 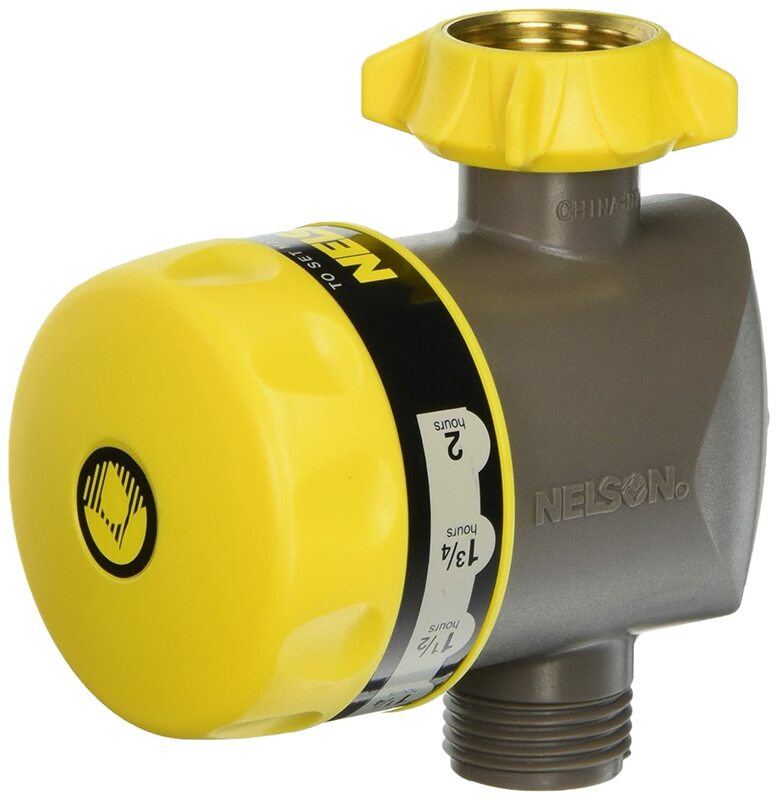 Nelson 56600 is a mechanically operated hose timer which requires no batteries to work. It is ideal for users who do not require any additional features as it offers only the basic functions - manual “on” and automatic “off.” The ergo swivel coupling is made of brass which should (together with the high-quality plastic parts) add up to the durability of this timer. As it is a quite simple device, installation and use are also very simple. You have to turn the timer manually (you cannot pre-set the time for it to turn on by itself), and can set it to turn off automatically up to two hours later. On the downside, there is a noticeable reduction in water pressure to the hose with this timer. Another complaint we have is that the timer is not 100% precise when determining "on time", but after using it for a while, we have gotten a feel for it and can set it accurately now. In short, it is an affordable basic device that will help you save water and avoid waterlogging your lawn or garden - ideal for those who often forget to shut off. 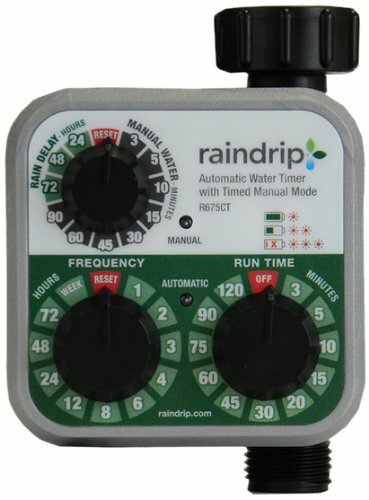 Raindrip R675CT is an analog, battery-operated hose timer which allows for some advanced features typical for digital timers. You can set the run time and the frequency of the irrigation but also have an option to run the timer for immediate watering manually without disturbing the automatic mode, and a manual rain delay option when you want to skip the watering for up to 72h (no rain sensor). It simply attaches to your outdoor faucet, the plastic is weatherproof, but we still recommend placing it in the shade if possible. It is fairly easy to program. The batteries do not last long if you have it set to run more than once a day, and this would not be a big issue by itself - but if batteries die during the watering session there will be no power to close the valve and flooding might occur. The left-hand dial sets the frequency of watering sessions and the right-hand dial sets the duration (minimum time is three minutes). We have not experienced any leaks or pressure reduction. Rain Bird SST600I is an automatic digital timer designated for indoor usage, but can also be used for watering outdoor plants. It is the most complex unit reviewed so far as it offers control for up to 6 zones at once. It sounds scary, but zone-by-zone settings are in fact quite simple to master. The timer has all the standard features such as choosing the start time and duration of the watering session. Moreover, it allows you to choose days in the week or even a season and has an option to install an automatic rain sensor to cut off timer during rain periods. The unit also has a protective case that shields it from weather elements and insects. The screen is large and easy-to-read LCD with backlit buttons. Wiring is color coded, and thus fairly easy to connect, and there is built-in troubleshooting of valves and wiring and surge protection in case of problems. Even in the event of power outage, the memory stays intact. On the downside, when you want to water your property more than once per day, you will have to choose predefined intervals that might not fit your needs. 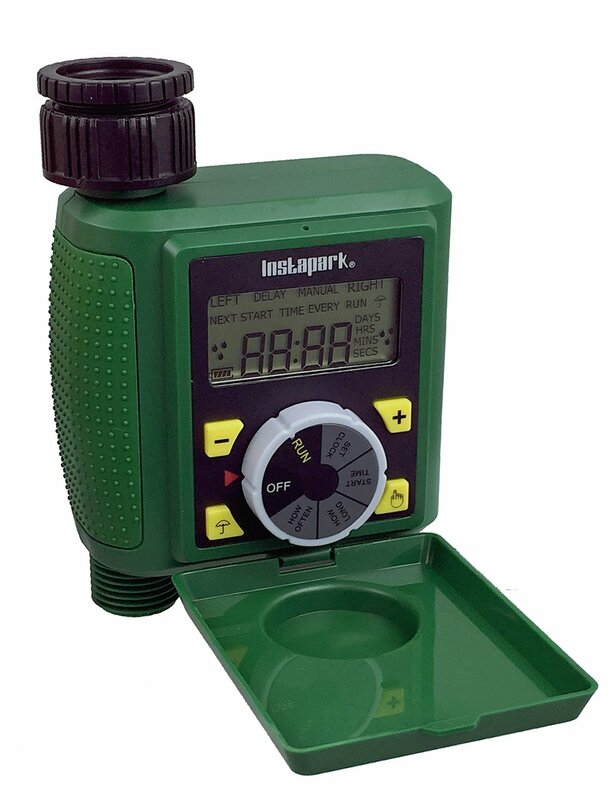 Instapark PWT-07 is battery operated, single outlet, digital outdoor hose timer. The unit features plastic ABS construction and a dust cover and is thus waterproof and durable. The solenoid valve easily attaches any faucet with standard (3/4”) thread. 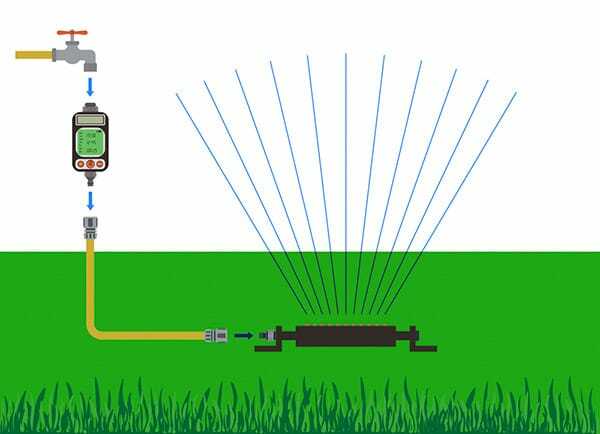 The timer has an option to control watering frequency and duration with user-friendly programming. Watering frequency can be set from 10sec to 7 days, and the duration from 5 sec to 360 min. There is also a manual Rain Delay option which can postpone watering to up to 72h (no rain sensor) and option to manually water without disturbing the pre-set automatic functions. The LED display is easy-to-read and large; it shows both current time and timer status. Due to low power consumption, the batteries should last quite long. On the downside, the timer lacks flexibility as it cannot be set to water an area more than once per day. Furthermore, the automatic turn on function is not 100 % reliable and can leave your lawn and garden dry in critical moments, so you cannot rely on it and leave your plants unattended for a few days. 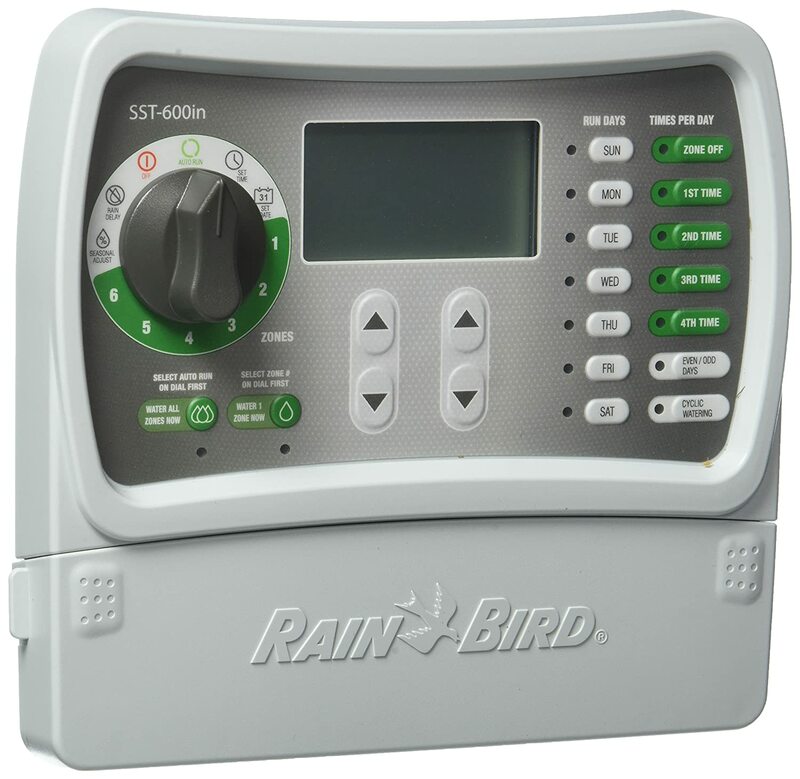 Rain Bird SST600I Irrigation Timer has set itself apart by the high-quality design and an array of functions which are easy to understand and use. It offers the most for the price you have to pay and has almost no faults. On the other hand, all the other reviewed hose timers have their advantages and disadvantages but will undoubtedly make your life easier and save your time and effort when it comes to watering your lawn or garden. Do not hesitate - buy the hose timer and make your life easier!